While I'm still here...a little love for the Colorado flag is in order. It may not have the abject glory of having a bear prancing on itself like California's flag and yes, it lacks Maryland's abject flaunting of the rules of corresponding colors, but the Colorado flag is pretty tight, as the kids like to say these days. 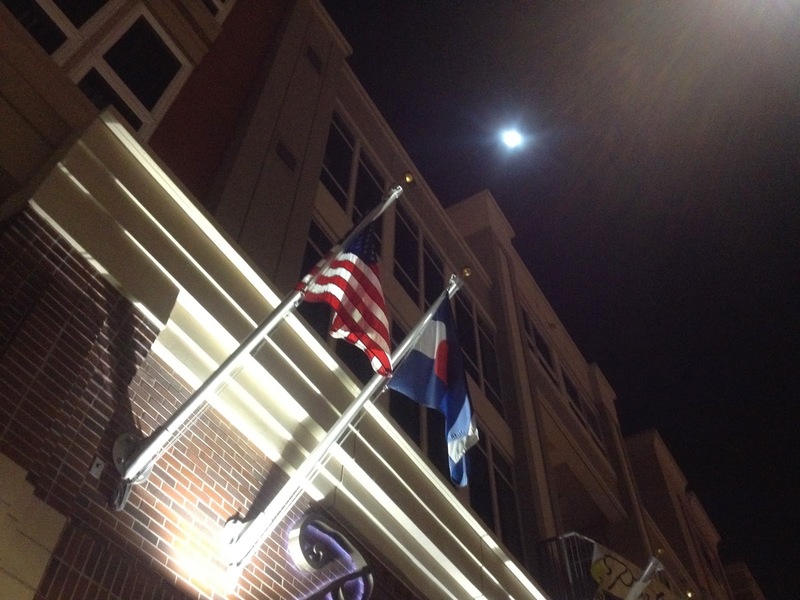 * I feel like we should appreciate the Colorado flag more, and not just on nights when I'm trying to find something cool to take a picture of that will come out in the abject darkness of 10:15 PM in November. Pretty cool picture for a guy desperate for a shot, though. Two great flags, an outdoor mall posing as classic architecture, and even the moon thrown in for good measure. I may have gone running out of obligation, but that picture was inspired. I think I'm going to double the salary I take for this blog. Done and done! Double of nothing is still nothing, after all...Screw it. TRIPLE my salary. I'm feeling saucy. Anyhow...queue the map. *I have no clue what the kids like to say these days.